The inclusion of the cooked egg yolk is intended to add richness without moisture and end up with a very sandy, coarse, crystalline texture. 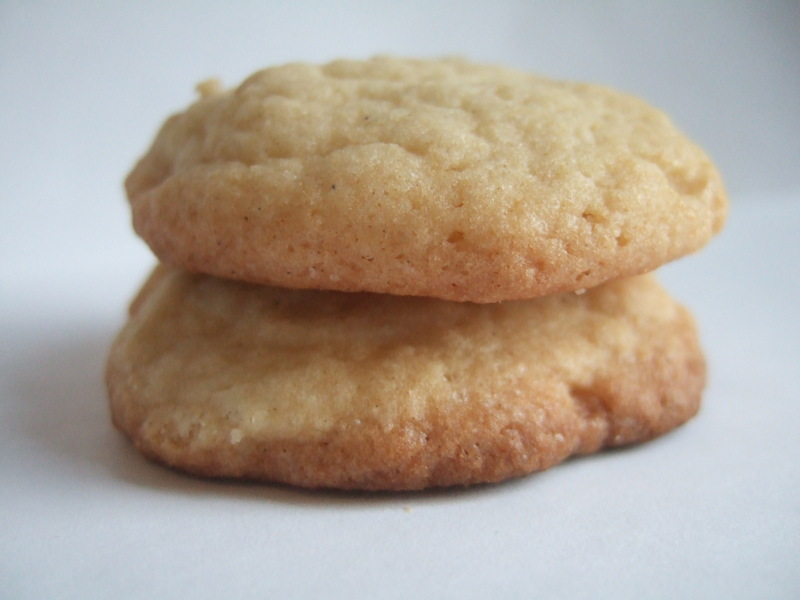 Cooks Illustrated has a recipe for French Sables that was a good example of this technique. How did the texture of this batch come out? 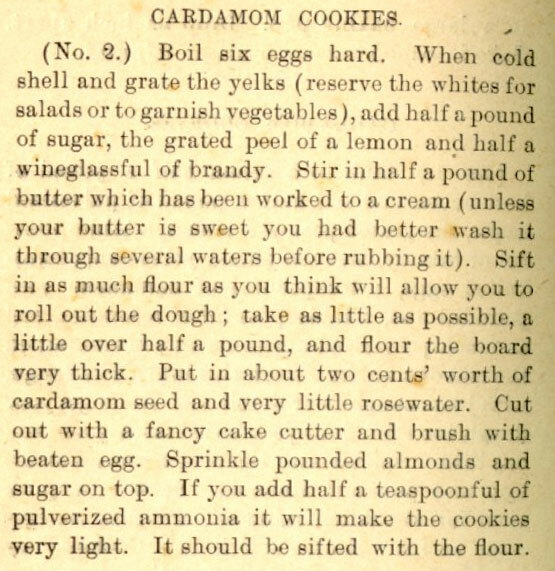 You know, I didn’t try it was this cookies, since I had a bad experience with another boiled egg/cookie recipe from the same cookbook called “Mother’s Delicious Cookies.” I found them to be dense and dry, but that’s a texture common to a lot of 19th c. cookies. But I could definitely taste the egg, which was unappealing. I’ll try and dig up the Sables recipe, I’d love to see an example of boiled yolks in a contemporary recipe. Amazingly, I did a mayonnaise with hard yolks. I was very wary of the idea but it made a fabulous mayonnaise (fresh eggs too!) that was creamy and delicious. Then I did a sauce with them from the 17th c and it too was great… not grainy at all… it works somehow… just don’t overcook the yolks and leave them golden in the middle. I must say, that combo of rosewater and cardamom is brilliant Sarah, no wonder you were drawn to it. The cardamom is an odd find in 19th century America. Not a lot of call for it, and even rose water was distinctly old-fashioned by 1889. Aunt Babette’s was a Jewish cookbook, right? I wonder if the combination of flavors goes back to Eastern European cuisine (about which I know nothing. Speculating wildly). I’m keen to try the grated egg yolks, just for historical interest. Agreed! I have not seen a lot of recipes calling for cardamom and three out of the four recipes I have come from Jewish cookbooks. So perhaps there’s some other culinary tradition that got carried over, or revamped in America? Rosewater and cardamon is one of my very favorite combinations.